WWE Extreme Rules 2015 is out on DVD and Blu-Ray now, available from www.wwedvd.co.uk. Broadcast live on Pay-per-View (and the WWE Network) from the Allstate Arena in Rosemont, Illinois, USA on 26th April 2015, the show features Seth Rollins defending the WWE World Heavyweight Championship in the main event against Randy Orton inside a Steel Cage, as well as six other matches featuring the likes of Cesaro, Dean Ambrose, Dolph Ziggler, Luke Harper and The Big Show, with stipulations including Chicago Street Fight, Kiss Me Arse and Last Man Standing. The disc includes over ten minutes of special features, including one further match. Michael Cole, Jerry Lawler and John "Bradshaw" Layfield provide the commentary. Dean Ambrose and Luke Harper's Chicago Street Fight starts the show, with plenty of weapon shots and backstage brawling, but falls apart with a weak gimmick. A Kiss Me Arse match between Dolph Ziggler and Sheamus manages to fight through the odd stipulation to produce a quality bout, with both performers working well in-ring to create a solid story. Whilst the post-match shenanigans seem to get a good reaction out of the Allstate Arena, it's not something that particularly appealed to me from a Home Video aspect. Tyson Kidd & Cesaro (accompanied by Natalya) challenge for the New Day's (this time Big E & Kofi Kingston with Xavier Woods at ringside) WWE Tag Team Championships in a stellar slice of tag team action, with both teams complementing each other and producing some great near falls. The entrances for Rusev (with Lana at his side) and John Cena's Russian Chain Match over the United States Championship are a little less elaborate than their WrestleMania encounter, and the "Russian Chain" that Rusev carries to the ring doesn't look particular impressive either. The bout fails to come anywhere close to the pair's bouts at Mania and Fastlane, becoming a plodding affair, with a disappointing finish. A Diva's Championship bout between Nikki Bella (with sister Brie Bella) and Naomi struggles against a heel vs. heel dynamic and whilst there is some decent stuff in the middle of the bout, there's not much to pique the interest here. 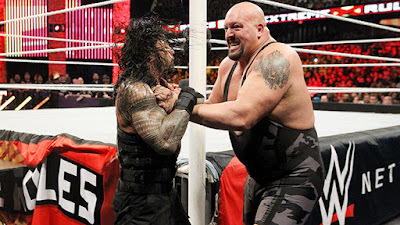 Don't write off The Big Show and Roman Reigns' Last Man Standing clash straight away, the contest is probably the most physical of the night. There's a string of quality spots, that build naturally to an exciting climax, and there's certainly plenty to enjoy here in what for me is the Match of the Night. You know when Kane heads to the ring to become "Guardian of the Gate" (or "Keeper of the Keys" whatever name WWE gave him) for the Steel Cage main event, that things perhaps aren't going to have satisfying conclusion. For their part Randy Orton and Seth Rollins put together a fine encounter over the WWE World Heavyweight Championship, that whilst at times is harmed by a lack of logic, also has a number of moments that play nicely into the match's other stipulation of Orton being unable to use the RKO. For me, however, the match will always struggle to overcome the amount of interference from The Big Red Monster, as well as J&J Security, with the final two or three minutes being way too overbooked for what the two performers really needed. As an overall PPV, this isn't one of WWE's strongest outings in 2015 and I wouldn't argue with you if you wanted to say it was their weakest of the year so far. However, there is still a number of bouts that are worth having in your collection, with the Last Man Standing bout being the strongest showing in my opinion and the Tag Team Championship contest doing the best in our Match of the Month polls (coming second to AJ Styles vs. Kota Ibushi from NJPW Invasion Attack), whilst the Kiss Me Arse match is also surprisingly good. Whilst two out of three main event level matches don't deliver on their potential, the Steel Cage match does still provide just enough to make it enjoyable viewing for it's time spent on screen.